Taco Bell decided to become more than a restaurant in the last couple of years: It became a lifestyle brand, complete with clothes and Fire Sauce chips. But the truth is, T-Bell was always more than a fast-food place. If the phrase Beefy Gordita Crunch doesn't stir your blood as much as Rilke's, "You must change your life," you may not have a pulse. 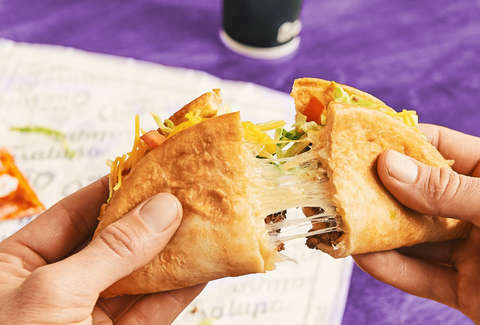 If the name of that fast-food item does inspire you, then we have some great news: Taco Bell is selling new cheeses for you to use at home to complete the life-wide Taco Bell saturation that is your destiny. The shredded cheese comes in four flavors: Zesty Ranch, Salsa Verde, 7-Layer Blend, and Breakfast Fiesta. Delish reports that the Zesty Ranch is Monterey Jack cheese augmented with ranch seasoning; the Salsa Verde is Monterey Jack, sharp white Cheddar, sharp Cheddar, and mild Cheddar cheese, and salsa verde seasoning; the 7-Layer Blend is shredded mild Cheddar, sharp white Cheddar, Monterey Jack, Asadero, low-moisture mozzarella sharp Cheddar, and queso quesadilla cheeses; and, finally, the Breakfast Fiesta is shredded Cheddar cheeses with both smoke and bacon flavors. 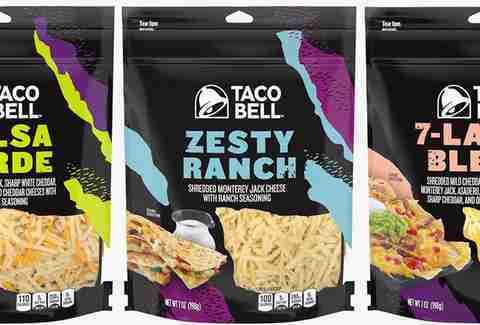 So you can bring that special Taco Bell something to anything: Those Taco Bell chips. Some scrambled eggs. Even a milkshake -- you'll be in the comfort of your own home; do what you want.